Potato chips are great. Homemade is awesome AND easy. If you are lucky enough to have a mandolin slicer, it’s faster but you can just slice the potatoes with a knife. You will need either a deep fryer filled with oil OR a wide skillet with about an inch or two of cooking oil. Heat you oil in the fryer to about 350 degrees Fahrenheit. Or heat up the skillet with oil until hot. It is ready when a test slice bubbles immmediately upon dropping in. Peel and slice the potatoes very thinly. One at a time, add the potato slices to the hot oil. Fry for about 10 minutes until the chips are crispy all the way through. Every couple of minutes stir them up to keep them separated. This will ensure they don’t stick to each other in spots and they will get crispy all the way like a chip should be. 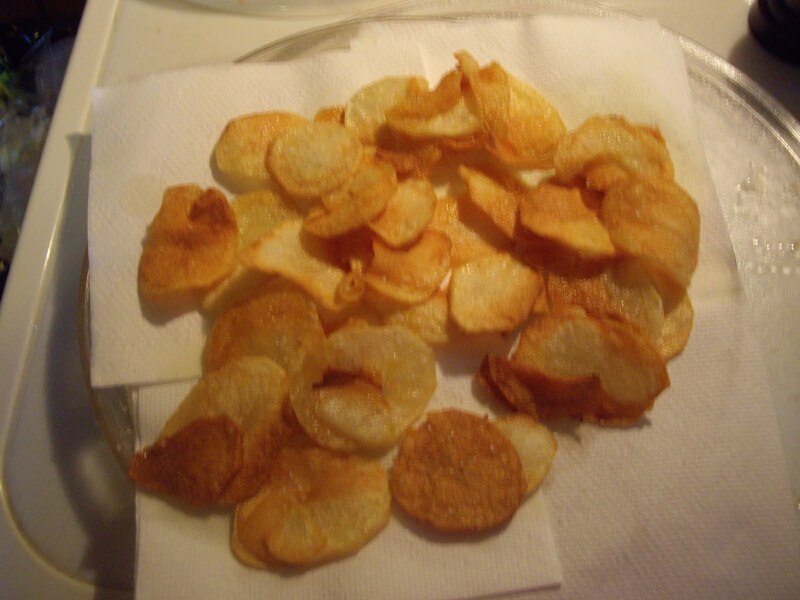 When they are crispy, remove from the oil and drain on paper towels. Season with salt OR any other seasoning you want to try. Makes enough for 4-5 people. Maybe more depending on the size of the potato or how much everyone eats.